Download Jackie in Digital HD from the iTunes store. Jackie images are © Fox Searchlight Pictures. All Rights Reserved. November 22, 1963, was the day Camelot ended and changed the face of politics in the United States forever. John F. Kennedy was our 35th President and one of the most beloved. His trip to Dallas, Texas was meant to bring a divided State back to the Democratic Party. Instead, John F. Kennedy was assassinated right in front of his wife's eyes. Jacqueline Kennedy was a quiet and demure woman, yet she was often the main focus of attention in any room. The perfect complement to her husband's often outgoing charisma and charm, she understood the importance of image, especially in the political arena. When her husband died, a grieving nation looked to her for their lead in how to slowly recover. The newest film in a sea of movies about this famous couple and that fateful day is Jackie. Opening in wide release in theaters this week, the Fox Searchlight film is an intimate, yet fictional, look at the First Lady during a tumultuous time in American history. Her dignity and grace at a time of personal tragedy formed a foundation for the rest of the country to follow. This movie is really made up of pieces ranging over the course of a little over one week. We begin with a Times reporter (Billy Crudup; Big Fish) visiting Jackie (Natalie Portman; Black Swan) in Massachusetts to write a story about the President and her one week after his death. She is sometimes vague, and other times demanding, all while painfully aware that this male reporter sees her as a fragile female in a male dominated world. His aggravation with her tenacity to "edit" him created a palpable tension between the two. The other portion of the movie is what happens the minutes and days after her husband's assassination. We see her with Robert F. Kennedy (Peter Sarsgaard; The Magnificent Seven) accompanying the coffin. We see her take off that now famous pink suit stained and showering to wash off her husband's blood. We see her making funeral arrangements and insist on the eight-block walk to the capitol and we see her in her private moments explaining to Caroline and John John why Daddy isn't coming home. Finally, we watch her privately grieve as she tries on every dress and piece of jewelry in her closet while listening to her husband's favorite record, "Camelot". The former portions of the film are less than stellar and not nearly as interesting as the latter portions. The interview scenes are condescendingly awkward from both characters and unfold at a rather slow pace. The private scenes and the moments in the White House are decidedly different in feel, as Portman's Jackie is, at turns, commanding and lost. She seems acutely aware that all eyes are on her and while she manages to hold her emotions in check, she also fiercely fights for what she feels is a dignified procession and funeral fit for a president. Portman is good as Mrs. Kennedy but she seems to get in her own way. Her portrayal of the First Lady is rather "breathy" a la Marilyn Monroe (ironically). Unfortunately, it is distracting at times, annoying at others. 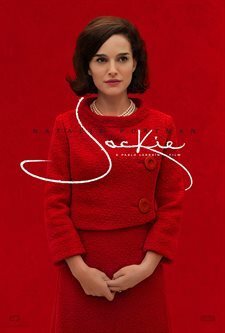 However, her portrayal of Jackie's emotions are fitting and poignant. Sarsgaard is solid as Bobby Kennedy and Crudup does a great job as the chauvinistic, yet professional, reporter. I wonder how much of the screenplay is based on truth and how much is dramatized for the screen. There are moments in the White House where you almost forget she is the First Lady and simply see a fragile, shattered woman who lost a newborn and her husband less than 4 months apart. The realism of those moments is a testament to Portman's acting ability as she manages to evoke sympathy from the audience while constantly sounding out of breath. As a drama, Jackie isn't bad but, as I mentioned, I wonder how historically accurate it is. Overall, it's a decent film especially for an older generation who remembers the young first lady and the day that changed lives all over America.